It is not unusual for politicians from Ansar Allah to send letters of this type. The group quite often appeals to various international bodies, especially the UN, as well as to important and influential countries. And the attack on Al Hudaydah, supported by Saudi Arabia and the UAE, and which threatened to cause a humanitarian catastrophe, was abandoned largely thanks to protests by the international community. And this is not the first time Ansar Allah has tried to initiate contacts with Russia. Representatives of the movement have been to Moscow for bilateral talks on several occasions. Some sources report that they proposed giving Russian companies access to Yemen’s oil and gas reserves in exchange for the political recognition of their government bodies as the only legitimate authority in Yemen. But the reason for the Houthis’ most recent letter is fairly clear: strategically they are in an impossible situation, as their opponents, the Saudi-led coalition, despite various reversals and difficulties, is displaying the remorseless tenacity of a bulldozer and continually cutting off the rebels’ supply lines. Two main factors are enabling Ansar Allah to survive: substantial support from Iran, and internal tribal allegiances. Neither of these are particularly reliable, and when the Saudi-led coalition is able to finally resolve the question of the blockade of northern Yemen then the unlikely alliance between the Yemeni tribal divisions and Ansar Allah will dissolve. That is why the latter have resorted to writing, in the hope that Moscow just might respond. 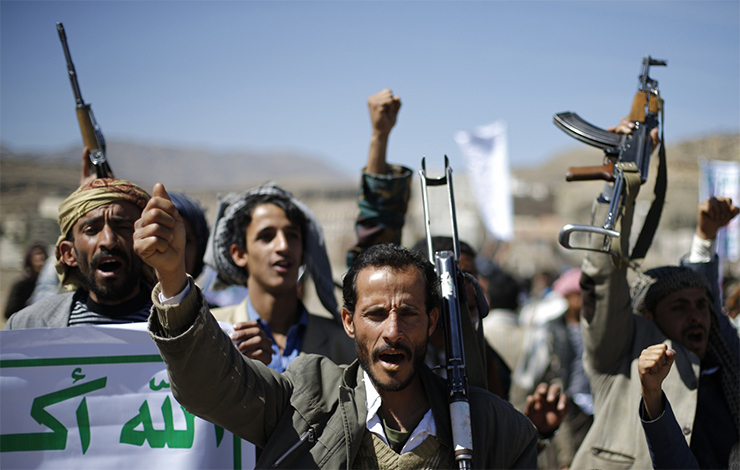 Naturally, as well as writing the Houthis are also trying to attract potential partners with various promises. Delegations from northern Yemen have visited Moscow twice in the last two years in an attempt to tempt Russia with the offer of the right to develop Yemen’s oil and gas reserves once victory has been secured. It is true that, by the standards of Saudi Arabia, the UAE or even Kuwait, Yemen is not particularly rich in oil and gas, and it also has a population of more than 25 million people. Yemen’s real value, however, does not lie in its oil or gas, nor even in the illegal arms trade (Yemen is the Middle East’s largest marketplace for weapons of all kinds). Like Syria, it is important, first and foremost, because of its infrastructure and transport potential. The Bab-el-Mandeb, the strait connecting the Indian Ocean to the Red Sea and controlling access to the latter, has a strategic importance equal to that of the Strait of Hormuz and the Suez Canal, especially in view of the volumes of oil and liquified natural gas passing through it on the way from the Persian Gulf nations to Western Europe. The strange thing about the conflict in Yemen is how similar it is to the war in Syria. Yemen also has its legal, if not legitimate, president, Abdrabbuh Mansur Hadi, who was previously vice-president under Ali Abdullah Saleh, and was appointed president after the latter’s departure from office in 2012. Abdrabbuh Mansur Hadi was supposed to serve for just 2 years: he was appointed as a short-term “emergency” president. His task was to bring about a national dialogue and hold legitimate elections in 2015. However, the national dialogue was unsuccessful, and Abdrabbuh Mansur Hadi’s authority expired, but no new president has been named, as it has been impossible to hold elections in the war-torn country. In order to hang on to power, in 2015 he asked foreign countries – the Saudi-led coalition, together with Sudanese mercenaries – to intervene, first in order to save and back up his regime and then to achieve a breakthrough in the civil war. This legal but not legitimate president and the coalition of foreign interventionists are being opposed by local armed groups. They style themselves as a national liberation army, In fact, they are particularly radical Shi’ite Islamists. The Ansar Allah movement’s goal is the declaration of a Yemeni imamate – a strict clerical or sharia-dominated state, with all that implies. Both of the sides in the Yemeni civil conflict are thus equally undesirable. It is interesting that most of the Russian coverage of the Yemeni conflict tends to sympathise with the Houthis. And now Moscow has, in effect, been asked to intervene in yet another civil war in the Middle East, but this time not on behalf of the legitimate government, as in Syria, but on behalf of Shi’ite Islamists. It can be safely assumed that Russia will not consider granting the Houthis’ request for military assistance. In any event, the general situation in the north of Yemen is going very badly, and this is unlikely to change. Finding a solution to this situation is going to take time. The humanitarian situation in the country is catastrophic: Yemen is already afflicted by famine and epidemics, war, and bombing. And no-one knows what to do about the situation. But no-one wants to get involved, and everyone is waiting for the Saudi-led coalition to end the war by military means. Even though this may take not months, but years.